I've been meaning to stop by and say hi for the longest time, and just finally got around to it. I hope both of you have a fantastic Thanksgiving!! 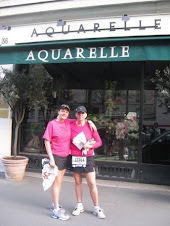 Oh ladies, sorry for the late Thanksgiving Day but I just rose from my gluttonous coma.. You femmes are the best thing that ever happened the the running and blog community...and to this here Fool :) I give thanks to Google and the Paris Marathon for connecting us.